Overall, the bias here is towards cars. But every so often, a truck comes up with a certain charm that’s enough to make it worth featuring. 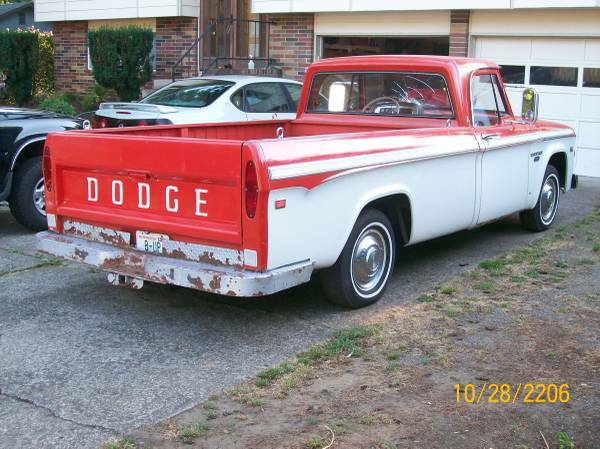 The Dodge D100 is one of those trucks – it’s a little funky, and definitely Dodge, and different for not being every other GM or Ford pickup out there. With a very boxy shape combined with goofy oversize headlight trim and styled sides, it looks a little like a gawky teenager, which is what pickups of the 1950s and 1960s were, in a sense – they were in transition from being a work vehicle to being a passenger vehicle. 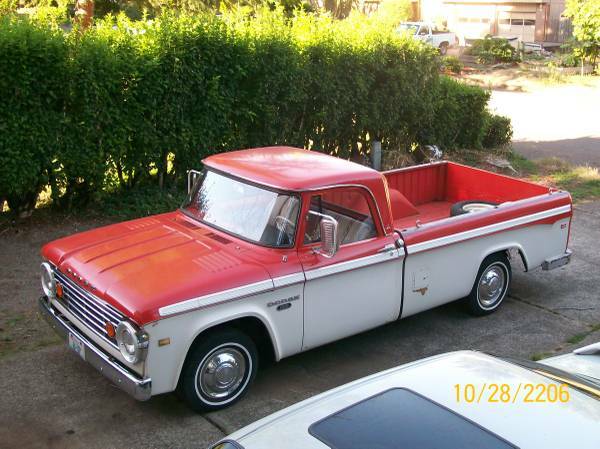 Check out this 1966 Dodge D100 for sale for $2400 in Vancouver, WA. Wow, looks complete all the way down to the hubcaps. Two tone paint can look really contrived, but works well on this truck. It does look to have some damage to the paint around the fuel filler door, but as long as it’s not rusting, this seems to add to its character. Okay, so you might want to touch up the bumper – this is a piece from before when bumpers were considered to be standard equipment on trucks. What does the license plate 8-UP mean? This truck is only equipped with a 318, so it can’t be referring to the motor. It really is quite charming, and might have been purchased by someone to use as a dual-purpose vehicle to achieve what one could do with a car and a truck in the past. The 318 is said to not smoke or leak significant amounts of oil, and to run pretty well. Recent service includes flushing and adjustment of the brake system and replacement of ignition parts. A little detailing wouldn’t hurt in the engine bay, particularly if the truck is only to be an occasional driver. 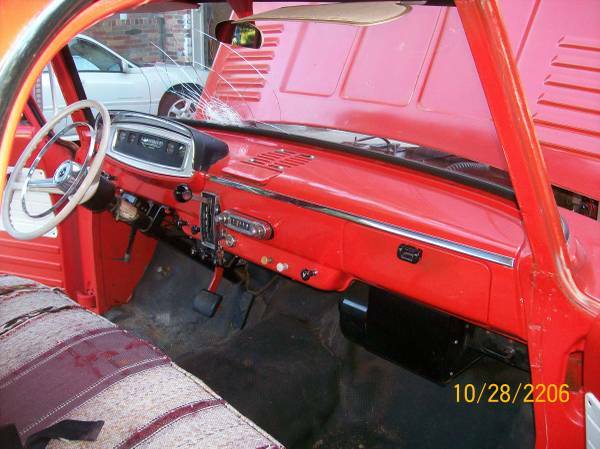 The interior looks quite decent, and the bench is said to be in decent shape, in spite of the cover. Sadly, a branch fell on the windshield in a storm last winter, so the windshield will need replacement, as will one of the mufflers. Still, with a little effort this could be a nice little truck for running around town – what would you do with it? This entry was posted on July 12, 2014 at 5:00 am and is filed under Feature. You can follow any responses to this entry through the RSS 2.0 feed. You can leave a response, or trackback from your own site. 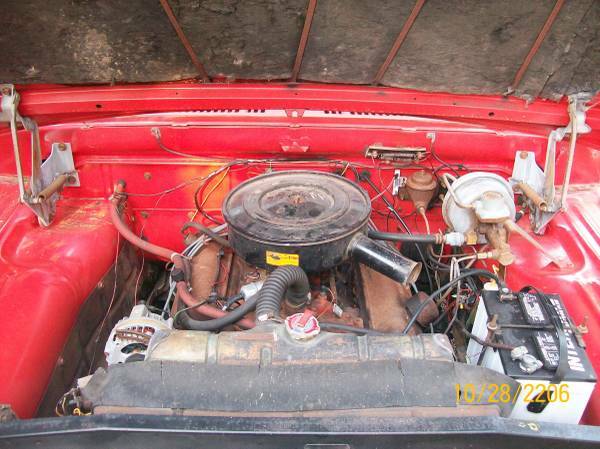 I like this, I don’t know how hard a windshield would be to locate and pay for, I think that’s an A motor and not an LA, but other then that it seems a solid deal and very cool looking.